Only one founder could claim the distinction of having signed The Declaration of Independence, The Alliance with France, The Treaty of Paris (ending the Revolutionary War) and The Constitution of the United States. 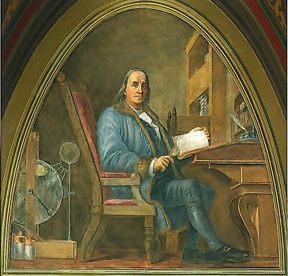 For a runaway printer’s apprentice, Ben Franklin did all right. By the time Franklin died in 1790, he was the most famous and admired man in America. Today’s media might label him a “Rock Star,” but that would be a poor analogy. Unlike the famous entertainers of our day, Franklin’s list of actual accomplishments was large and lasting. He was an author, printer, inventor, politician, diplomat, political theorist, marketing genius, civic leader, scientist and satirist. He was considered a sage in the truest sense; he had the wisdom that comes with age and experience. More than once he showed himself a bit of a prophet as well. has almost taken on a sense of scripture to liberty loving Americans. But the other day when reading Franklin’s closing comments at the Philadelphia convention that created our national charter I saw something that I had not seen before, a quote that is usually cut off before completion. Words that make his “republic” quote seem mild. In 1787, at 81 years of age, Franklin was the oldest of the delegates. His health was deteriorating, his feet were wracked with gout, and his once strong swimmer’s body had long since grown round. Still, his presence at the convention was second in importance only to Washington’s. The delegates knew that the presence of Franklin and Washington gave strength and legitimacy to their work. Franklin followed his usual style in meetings of this type: he listened, he slept, he did not publically debate and he said little--just as he had done during the 2nd Continental Congress a decade before. Franklin always preferred to debate and hammer out details in private, where disagreements could be discussed rationally. When he did speak in a session, it was with purpose and worth listening to. On the last day of the more than four-month-long convention, Franklin planned to give a short speech. Unfortunately, he was too ill to deliver the speech himself, but instead had fellow Pennsylvanian James Wilson do so for him. 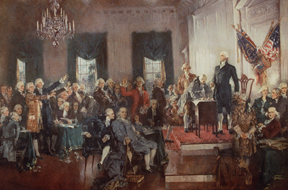 The Constitutional Convention with Franklin at the center. The speech itself is classic Franklin--self depreciating, anecdotal, charming and thought provoking. It was designed to help all the great minds (and those who felt themselves to be) put aside their own minor disputes for the service of the country as a whole. But there in the middle of the speech is a warning. This warning is as stark and relevant today as if Franklin were standing in the room with us personally. In it he realistically acknowledges that no government lasts forever and then goes further to point to exactly when and how the meticulously designed fruits of their labor would end. Three years later, his own course of years completed, Franklin died. In his last years he never stopped encouraging his fellow citizens to embrace, improve, and defend liberty, writing several essays on the importance of the abolition of slavery. His funeral was attended by an estimated 20,000 people. The estimated population of Philadelphia at the time was 28,522.